OMEGA's PX01 Series transducers are very high-accuracy industrial pressure transmitters. The all stainless steel construction and hermetically sealed case make them suitable for harsh environments. They are true high accuracy devices, with a "double diaphragm" design for high reliability in industrial areas. 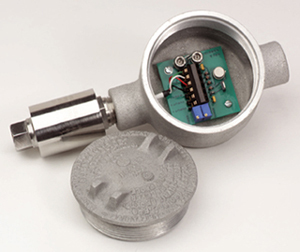 A broad temperature-compensated range of 16 to 71°C (60 to 160°F) and a high operating range to 121°C (250°F) make these transducers very stable in applications with fluctuating temperatures. The PX01 is available in gage, absolute, or sealed models as well as in psi or metric ranges. NPT and 7/16-20 O-ring seal fittings are available for industrial and hydraulic applications. 注: 2 and 5 psi Ranges available only on amplified output. 1/4 HP Tube Fitting supplied for ranges 10,000 psi and above.